I do it all the time – nearly every day. I have been without an oven for over 6 YEARS. It’s a difficult situation for a person who really enjoys baking. Disclaimer – this is not intended to be a cooking blog. But in my everyday musings and archiving of events, it’s bound to happen, no? Lately there are many online recipes featuring roasted vegetables, and they look so lovely (and so easy!) that they have a clear appeal. 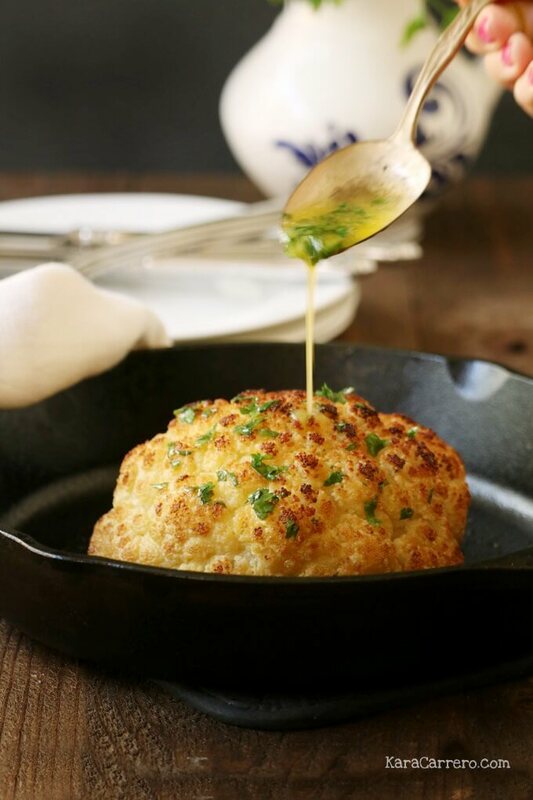 I was tempted by a roasted cauliflower recipe, and I decided to prepare a slow cooker version. I was fully aware of the differences and limitations of slow cooker cooking, but hopeful that I might end up with an edible and possibly deliciously satisfactory outcome. I was hoping! This photo was my goal. I began with a lovely cauliflower purchased in a nearby town at a Thursday visit from a traveling vegetable vendor. You can check out the recipe at this pleasant site: http://karacarrero.com/how-to-eat-make-roasted-cauliflower-recipe/. I liked the idea of the butter and flavorings mixture, which would make a beautifully browned top in an oven. I used some room temperature butter, rubbing it onto the cauliflower, and then sprinkled all the exposed areas with a Penzey’s spice mixture called Mural of Flavor. You’re not yet acquainted with Penzey’s, you say? Check them out online. They have many scattered locations, as well as an inspiring business ethic. I had trimmed the stem end on the cauliflower and set it in the bottom of the slow cooker with a little water (about 1/2 c). I cooked it for about 3 1/2 hours on high, and checked it when we were ready to eat. It was ready too. It was not browned, just as you would expect from slow cooking. But it was delicious. Let me know if you try it. This entry was posted in Penzey's Spices, Uncategorized and tagged rancho life in Mexico on March 25, 2017 by gubabbaboy. I love roasted cauliflower. It’s really hard to stop eating it, and Jon hates cauliflower, so I often end up with a stomach ache when I make it. I have never roasted the head whole. I break it up into small pieces, stir in a bowl with olive oil and salt (and curry sometimes), and roast in a Pyrex dish covered in foil so I don’t need to scrub it later. It’s good hot, cold, tossed in a salad the next day, etc. Sounds delicious! I’ve been roasting all kinds of vegetables, including Brussels Sprouts with pancetta. I bet you can get a solar oven if you really want to bake! Yeah, that’s the thing about cauliflower if you’re the lucky person who likes it – it’s good just about any way!